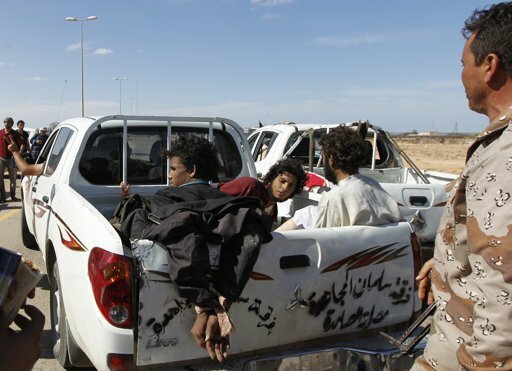 A human rights group says it discovered 53 decomposing bodies of Gaddafi loyalists in his hometown of Sirte. It seems to be a part of a trend in killings, lootings and abuses by the rebel forces. A human rights groups says it has discovered 53 decomposing bodies, apparently of Moammar Gadhafi loyalists, some of whom may have been executed by revolutionary forces. The group urged Libyan authorities to rein in armed groups. The latest discovery of the grave came to light as Libya’s new leaders declared the country liberated, following a brutal eight-month civil war. The declaration was overshadowed by continued questions about whether Gadhafi was executed after capture last week.